Writer, critic, and film lecturer Teruyo Nogami also served as one of Akira Kurosawa’s principal assistants. Hired as script supervisor on 1950’s Rashomon, Nogami went on to work on all of Kurosawa’s subsequent films, later chronicling their unique relationship in her 2001 illustrated memoir Waiting on the Weather: Making Movies with Akira Kurosawa. We asked Nogami to recall what it was like on the set of Dodes’ka-den, a film that came at a crucial point in the master filmmaker’s life. Nogami also contributed original sketches, inspired by Dodes’ka-den, for this release. Can you tell us a few stories from the film’s production? A lot did happen, but one episode that particularly stands out in my mind came on the first day of shooting. That was April 23, 1970. The previous year, after Kurosawa was let go as director of Twentieth Century Fox’s Tora! Tora! Tora!, a rumor got started that his mental health was deteriorating, so to lay that notion to rest he needed to make a good film. With the help of many people, now he was finally able to do that. Production got started on his first film in five years, after Red Beard, with a scene where the character Rokuchan is driving an imaginary streetcar. They rehearsed it again and again, and at last they were ready for a take. 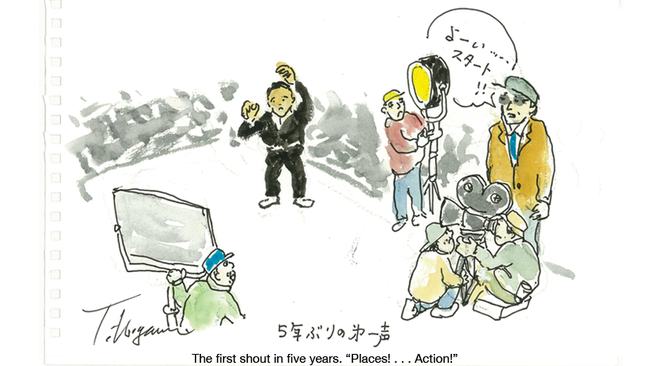 Kurosawa’s voice rang out: “Places!” Then, after a pause, “Action!” His voice had a quaver in it, even a hint of tears. When the crew and cast heard him, everyone thought, Ah, the old Kurosawa is back. The mood was electric. I’ll never forget how moving it was. Did Kurosawa have any concerns or hesitations about working in color? Well, Kurosawa was also a painter, you know, so of course he enjoyed the chance to use color for the first time. I remember he told the crew to come to work in colorful clothes. He said that now that we were working in color, we might as well have a good time. For the colors on the set, he had an assistant hold a paint box while he held the brush and painted for all he was worth. For Dodes’ka-den, he made the choice to work with a whole new cast of actors. Did this in any way alter his method of directing them? It’s true, a lot of the actors had never been in a Kurosawa film before. One of them, Junzaburo Ban, was used to doing comedy. He had the difficult role of Shima. Ban had a tough time memorizing long dialogue, but one nine-minute scene had to be shot all in one take. It’s the scene where Shima invites people over to his house to drink sake. The guests complain that Shima’s wife is acting high-handed, and things degenerate from there. It’s a good scene, but Ban was so nervous that they had to do endless retakes. Each time, a production assistant had to replace the film roll. The old Kurosawa would have lost his temper and started yelling, but instead, every time, he just said gently, “All right, let’s try it again.” When they finally made it through the nine minutes, Kurosawa went over to Ban and said, “Good job.” Ban sank to the floor as if all the strength had drained out of him, and shook hands with the director with tears in his eyes. Another example: Kamatari Fujiwara played an old man who says he wants to die, that he doesn’t want to live another day, and Atsushi Watanabe played a sharp-witted old man who gives him a digestive, telling him it’s poison. The two of them had a great eight-minute scene, full of terrific dialogue, but Fujiwara was famous for his inability to memorize his lines; he just couldn’t seem to come up with them. Finally Kurosawa had had enough and ordered me to give him prompts. That was fine as long as we were rehearsing, but if I did it during a take, my voice would be recorded too. Still, without prompts Fujiwara kept messing up his lines, so in the end I had to deliver them in a loud voice that was recorded right along with the actors’. I remember that afterward they had a devil of a time deleting my voice from the tape. What was Kurosawa’s mood like during this production? This is sheer conjecture on my part, but I suspect he was reacting to what went wrong on Tora! Tora! Tora!—making a kind of rebuttal. For one thing, I never saw him so quiet and undemanding on a set before. For another, he actually finished two months ahead of schedule. The film was in the can in just twenty-seven days. He even came out and told us, “This time I want to make a film that’s sunny, light, and endearing.” You know the scene where Rokuchan, the retarded boy, runs along, saying “Dodes’ka-den, dodes’ka-den” [clickety-clack], while neighborhood kids throw stones at him and shout, “Trolley-crazy! Trolley-crazy!”? Every time I watch it, I get a lump in my throat. I imagine Rokuchan as Kurosawa, with people yelling “Movie-crazy! Movie-crazy!” at him. Was he personally satisfied with the final film? On the last day, we were again in the “town without seasons”—that’s the title of the book the film was based on—a set that was erected in a dump in the plebeian, “low town” section of Tokyo. While the stagehands were cleaning up, Kurosawa stood all alone in the middle of the set. He told me afterward how lonely he felt: “I hated to think I’d never see any of them again—Rokuchan, Shima, Tanba, and all the others who’d lived there, all the characters in the film. It got to me. I couldn’t bear to leave.” After Red Beard, he’d endured five years of inactivity, at the mercy of Hollywood financing. He may have been anxious about what lay ahead in the next five years too. Can you recall for us Kurosawa’s difficult period soon after the film’s release? After that, even when we traveled to the USSR, foreign reporters had no compunction about asking Kurosawa straight out why he’d wanted to kill himself. He always answered the same way: “At the time, I couldn’t bear to go on living, not for one more minute or second.” What made his life so unbearable he never said. What stands out for you most when thinking about this film? I was happy to be working with Kurosawa again for the first time in a while, but I did have the feeling that he was recuperating, that he wasn’t operating at full strength. I think Tora! Tora! Tora! had been a huge shock to him. On the set, he never yelled at anyone the way he always used to. He was always smiling, always gentle with the crew. What I think he probably enjoyed more than anything was the chance to do his own painting in color. At first, all the drawings on the walls of Rokuchan’s house were ones that he himself had done at home. But when he hung them up and looked them over, he decided they were too grown-up. He’d tried his best to paint like a child, but when he saw it didn’t work, he got schoolchildren to paint pictures of streetcars and used those instead. He never used the pictures that he’d stayed up all night to paint. That’s the side of Kurosawa that I admired; that’s the Kurosawa I loved.